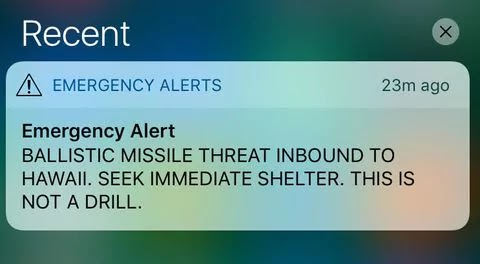 An emergency alert that warned of a ballistic missile heading directly for Hawaii on Saturday, which was mistakenly sent out, caused panic and outrage among celebrities, politicians, vacationers and locals. It took the agency 38 minutes to send a follow-up alert correcting the error. Fox News' Greg Gutfeld said on Twitter that his wife, who was at a hotel when she received the alert, said there was "total hysteria/chaos. families evacuating told to seek a shelter. crying panic." Actor Jim Carrey tweeted that he "woke up this morning in Hawaii with ten minutes to live. It was a false alarm, but a real psychic warning." Sen. Mazie Hironi, D-Hawaii, tweeted that she would work to find out why the alert was sent out. Jane Bartlett Pappas, whose brother Alex Pappas is a reporter with Fox News, is on the island of Oahu and while she received an alert on her phone, no alarm system actually went off on the island. Pappas added she didn't receive a notification that it was false "until 30-40 minutes after the initial alert. I saw people getting into their cars and running across the street." She also added that the beach is now "crowded with people swimming and enjoying the beautiful day!" Hawaii Gov. David Ige said in a statement that "While I am thankful this morning’s alert was a false alarm, the public must have confidence in our emergency alert system. I am working to get to the bottom of this so we can prevent an error of this type in the future." He added he's meeting with top officials to figure out whay the alarm went off "and to prevent it from happening again." Rep. Tusli Gabbard, D-Hawaii, who sent out one of the first tweets warning that the emergency alert was not accurate, later tweeted that "Everyone in American needs to understand that if you had to go through this, you would be as angry as I am - I have been talking about the seriousness of this threat for years." "Our leaders have failed us for decades" Gabbard noted, and added that Trump "is taking too long, needs to take North Korea's "threat seriously," and that "we have to talk to North Korea and find a peaceful path to get rid of this nuclear threat." Twitter user @brynguist wrote the time after she received the emergency alert "were the most terrifying of my life, until I finally checked twitter and saw this." Jill N. Tokuda, a Democratic member of the state's Senate, tweeted that she "saw soccer parents running off the field in fear; my boys & nieces are still very shaken." A similar state of alarm and dismay manifested along the H-3, a major highway north of Honolulu, where vehicles sat empty after drivers left them to run to a nearby tunnel after the alert popped up, the Honolulu Star-Advertiser reported. According to The Associated Press, professional golfer Colt Knost, staying at Waikiki Beach during a PGA Tour event, said "everyone was panicking" in the lobby of his hotel. Democratic Hawaii Sen. Brian Schatz tweeted that the false alarm was based on human error, and added: "What happened today is totally inexcusable. The whole state was terrified. There needs to be tough and quick accountability and a fixed process." Sara Donchey, an anchor with Hawaii-based KPRC-TV, tweeted that her family was hiding in their garage, and her mom and sister were both crying after receiving the emergency alert. Twitter user @JasonMan811 tweeted that his father, who is in Hawaii, sent him a text that read, "People ran out screaming at breakfast," after receiving the alert. "The line went down so I got more food at the buffett. Cleared out the place." Rep. Dan Kilee, D-Mich., tweeted: "There should be a very close review of the emergency systems in place to make sure another false alarm isn't the result of a single human error."